I just returned from a trip to Zion and the Grand Canyon to capture some "Icons of the American West" during the Autumn season. 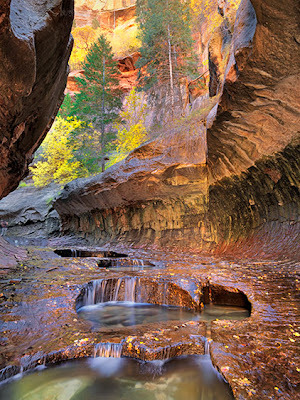 I hiked up into a remote slot canyon in Zion National Park to capture an image of a canyon formation known as the "Subway". The hike entails a lot of boulder hopping and creek crawling up the left fork of the Zion river. The National Park Service controls access to this area and only allows a limited number of hikers in each day through a permit system. It is an all day hike out and back, but well worth the effort to visit this very magical place. 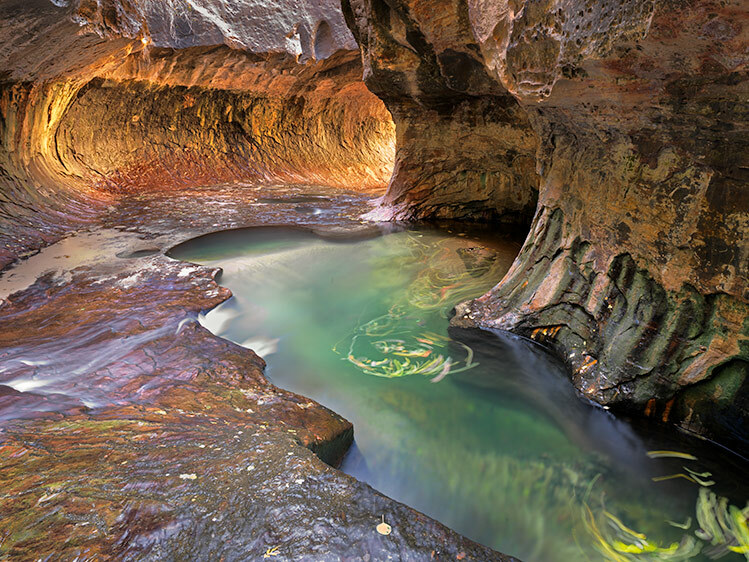 This formation is an area where the slot canyon narrows and the water has carved a tunnel that happens to be oriented in a way that glows in the midday sun. To add to this drama is a beautiful emerald green pool in the creek next to the rock formation. The Autumn leaves were floating in eddies in this pool making light streaks during my long exposure. I carried my Hasselblad H4D on the hike so I could capture the scene with my 28mm lens. There were other photographers at this location - some of them had rented drysuits so they could take an image of this formation from inside a 6 foot deep pool inches to the right of where I was standing to get this image. I was super careful not to step backwards or slip into this pool with my camera! As it was I had to stand in ankle deep water with my tripod. The day was a great adventure and I was pleased to come away with two new releases to my fine art print collection from the Southwest. My next post will be on some sunrise and sunset images from a dramatic and remote area on the north rim of the Grand Canyon. Liz, simply gorgeous! Next time, I'm going there for sure! Elizabeth brings God to us and I am so very grateful! Absolutely stunning images. I guess I'm okay with how hard it is to get there, otherwise it would be overrun. I dunno if I'll ever be fit enough to make that trip. In the meantime, I'll just enjoy your work here.